Upon arriving at Sabang Gapang Beach in one piece albeit a little pissed off with the logistic screw-ups, we decided to grab whatever sunlight remaining for the day to do a shore dive. Although the house reef was just right infront of the dive center, we had to walk carefully into the sea because of the low tide level which exposed us to a lot of rocks & corals and other unseen dangers such as a stonefish! Upon descending, I was kinda disappointed with the bad visibility. Heck… wat was I expecting during a low tide? 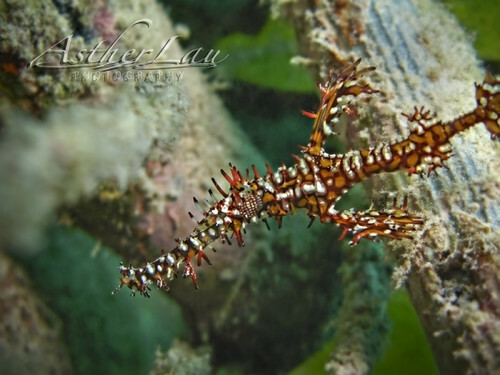 Right… here are some photos taken from our check-out dive at the house reef infront of Lumba-Lumba Diving Resort. 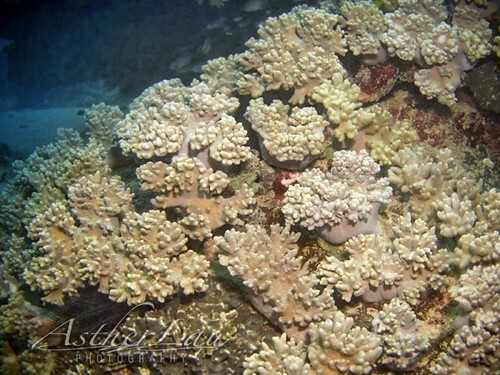 The first thing that caught my eyes were the healthy corals at the house reef. Lucky thing the tsunami didn’t destroy everything. 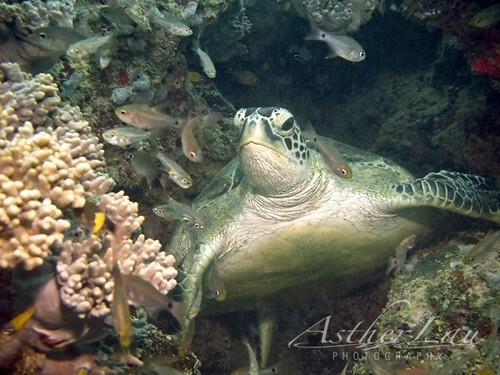 We came upon a green turtle resting in a small crevice on a big boulder. I think it was getting ready to sleep. 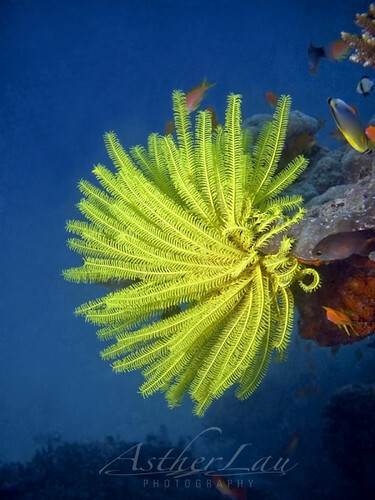 This bright yellow feather-star looked like it’s glowing in the darkening surrounding. 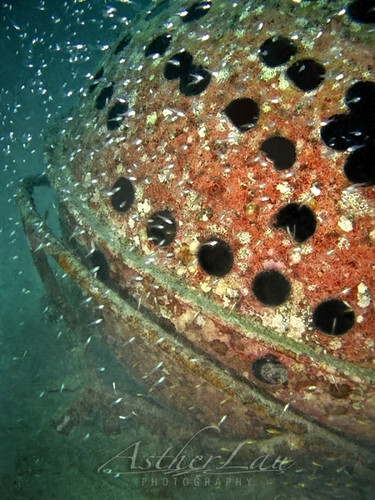 The divemaster brought us to this artificial reef ball made of metal where he believed a ghost pipefish is currently staying. And walah! Here’s the little critter. It’s a male from the look of it. It was well protected, hiding among the rubbles of rocks and what-nots. 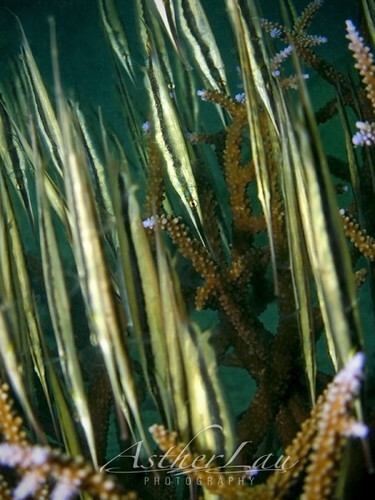 I was also very impressed with the swarms of razorfishes in this shore dive. Each fish is huge in size compared to the many I’ve seen from other places. Amazing display of a healthy school here. 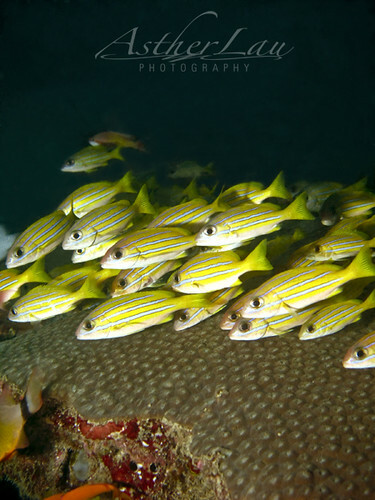 The house reef also plays an important role as a breeding & growing ground for this beautiful school of snappers. I emerged from the water feeling a lot more better and boy… was I starting to get really hungry! More photos in my Flickr Album. Will blog more about Bandar Aceh & Pulau Weh later with more photos, so stay tuned.